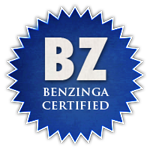 In one more praise of the internet and its possibilities in terms of readers feedback here is some statistics that show the most popular search engine submissions that guide readers from all knowledge levels to The Prudent Investor (TPI) blog. 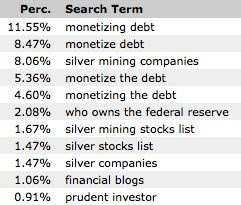 "Monetizing the debt" has just replaced "silver mining companies" as the most popular search term and its variations. In a rough guess I would estimate that the list of silver mining companies has been the most read blog post this year. Enjoy my older but often timeless writings in my archive in the sidebar as I am off into a long weekend thanks to the many holidays Austria still celebrates.